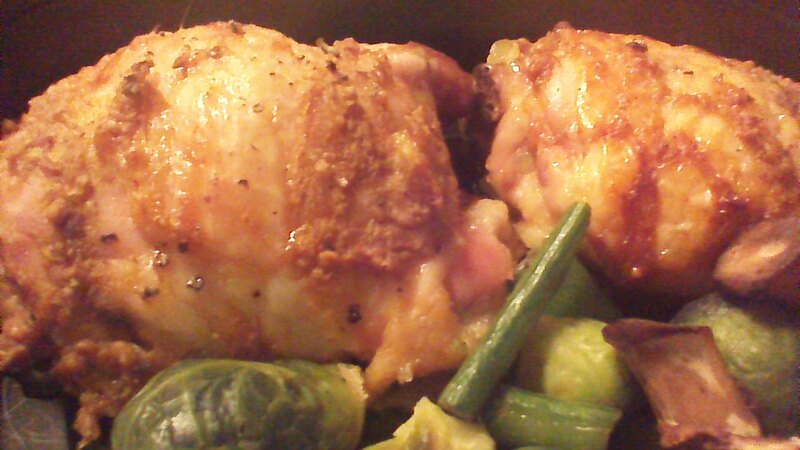 Chicken thighs are my favorite for baking and roasting. They are juicier (and less expensive!) than chicken breasts, meatier than wings, and contain a more favorable mix of white and dark meat than drumsticks. The uniform size and thickness of chicken thighs means they are easy to arrange in a baking pan and cook evenly every time. This Peach Mustard Baked Chicken recipe offers a simple preparation for chicken thighs. We’re combining the classic flavor of honey mustard with the bright sweetness of peaches to make a marinading paste. If fresh peaches are out of season, no worries. Frozen peach slices will work just fine! Step 1) Thaw peach slices if frozen. Puree honey and mustard with 1 cup peach slices until a smooth paste forms. 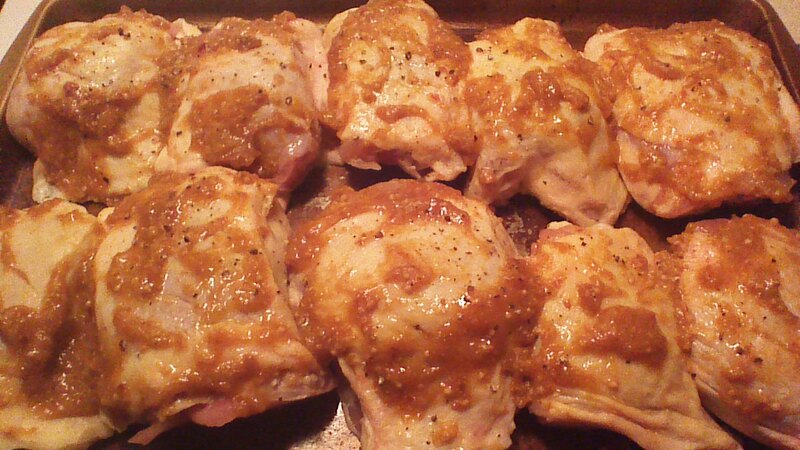 Step 2) Arrange chicken thighs on a baking sheet with shallow sides. Using a very sharp knife, score the skin on the top of each chicken thigh in one or two places. Step 3) Rub the peach mustard paste onto each chicken thigh. Step 4) Bake chicken thighs, uncovered, in a preheated 350 degree oven for approximately 40 minutes. Check the temperature of a chicken thigh with a meat thermometer. When the internal temperature (not against a bone!) reaches 165 degrees F, your Peach Mustard Baked Chicken is ready to enjoy! Garnish with additional peach slices just before bringing your chicken to the table. I recommend serving this with fresh baked cornbread and a green salad. Delicious! This entry was posted in Gluten Free, Main Dishes and tagged chicken, children, Cooking, dinner, Family, Food, frugal, gluten-free, Homesteading, Paleo, recipe. Bookmark the permalink. ← NEW Global Recipe Index!